How Many Coffee Grounds for 100 Cups of Coffee? 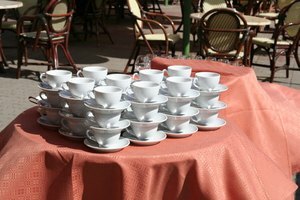 If you're making coffee for a large special event, it's easy to treat it as an afterthought. But good coffee is one of those important details that people will thank you for later. Here's how to find the right coffee-to-water ratio to make the tastiest, most aromatic coffee when using a 100-cup coffee maker. People are as different as their palates. Some like strong or medium coffee while others like mild. What are the odds that the coffee in a 100-cup coffee maker is going to appeal to everyone? Your best bet is to go with a medium brew that won't completely turn off people on either side of the spectrum. One gallon of water is equivalent to 16 cups, and 6.25 gallons of water equals 100 cups—that's how much water you should put in the urn. Most coffee makers come with instructions and recommended coffee amounts for mild to strong coffee. On most high-volume coffee makers, the percentage of coffee begins to decline slightly when the number of cups increases. Two tablespoons of coffee is an average amount of coffee grounds to make one standard cup of coffee; but if you use that same ratio for 100 cups of coffee, you'd be using roughly 12 1/2 cups of coffee grounds. That's almost twice the recommended amount of coffee for most commercial 100-cup coffee makers, which usually call for 6 to 8 cups of coffee grounds for the variant spectrum of mild to strong coffee. Experimentation may be necessary to truly get the taste of the coffee right. For a safe start, try using 6 1/2 cups of coffee grounds. If it's still too weak, increase the grounds volume by 1/4 to 1/2 cup next time. 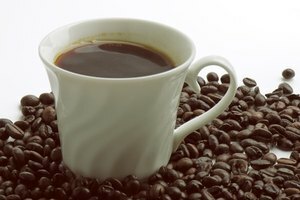 Chowhound: Coffee in a 100-Cup Coffee Maker - Advice?